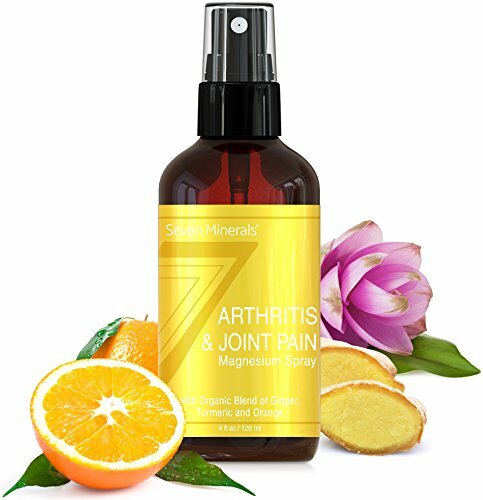 100% NATURAL FORMULA: Enjoy joint & arthritis pain relief the all-natural way with our blend of pure magnesium oil and USDA organic ginger, turmeric and orange essential oils. MUCH FASTER RESULTS: Made using quick-absorbing magnesium chloride, this arthritis pain spray gets to work much faster than pills, ointments, and creams for faster pain relief. HONESTY ALERT: There is no guarantee that Magnesium deficiency is the root cause of your joint and arthritis pain, BUT studies show that more than 2/3rds of Americans are Magnesium deficient, a leading cause for joint pain. And as you'll find in the reviews, it works for MANY but not ALL of our customers. If you find that it "Didn't work for me", drop us an email and we'll refund you right away with no hassle - TRY IT OUT ON OUR EXPENSE! EFFECTIVE PAIN RELIEF: The pure magnesium oil in our arthritis pain reliever manages joint pain with its anti-inflammatory function, improving calcium absorption, and reducing oxidative stress. MADE IN THE USA: The magnesium pain relief spray is mined from its purest state in the USA, is completely free of toxins, and proudly cruelty-free.